A Community of Japanese Maple Lovers and Enthusiasts! 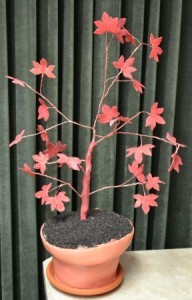 There are a number of different types of Japanese maples available for purchase. Although they may look similar the leaves can change into very different colors which can lead to different effects for your garden. As well some species of Japanese maples are a little tougher and heartier than others and grow into different sizes. With over 23 species it can be very hard to keep track of all the types of Japanese maples. The following article will explain the differences between a few species of Japanese maples. Get Paid for Making Baby Plants! Amoenum Group: This type of Japanese maple generally has the fullest leaves. Species such as the osakazuki are in this classification. The leaves will resemble that of a Canadian maple but with more defined tips, in general this group is one of the more hearty forms of Japanese maple and is a bit more resistant to cold and wind. Matumurae Group: These are considered one of the most elegant types of Japanese maple. The leaves in general are almost completely divided at the stem. The thin leaves are large enough to give the tree real depth and it usually blooms purple towards the fall, while smaller leaves may not create the same depth of color the matumarae group has dainty leaves which are big enough to really block in the color of your garden. Small Plants at Home Click here. Palmatum group: These are usually found in the wild and have fairly thick leaves as well. They don’t have quite the same base as the amoenum group but they do have much finer points and an interesting color contrast between the reddish stems and the green leaves in the summer and spring. Dwarf Group: These are much smaller forms of Japanese maple which are perfect for smaller gardens. Their leaves seem to vary, but for the most part they are all fairly thin and dainty. A dwarf Japanese maple is great for adding a bit of color to a small garden, because it will not completely take over like some shrubs. Dissectum group: These leaves are very lacy, almost comparable to seaweed in the thickness. Because of this it creates a lovely texture as well as color contrast in a garden. Having a small Japanese maple from the dissectum group can change things up and draw the eye. The leaves are quite susceptible to frost, but look great when they come out. Linearilobum group: This form of leaf resembles a tropical plant almost, with extremely pointed leaves which are divided at the base of the stem. This type of Japanese maple is great in hot conditions and can break up a garden dominated by mostly green plants. The leaves resemble more of a bush than a tree and are great for changing the look of a garden or backyard. As you can see there are many different types of Japanese maples. There are plenty of different options to use these trees to add a spot of color to your backyard. By using this guide you can select the type of leaves and tree you want so that you can get the best species of Japanese maple for your personal needs. A picture is worth a thousand words. How about showing a closeup photo of each group and a very up close photo of an individual leaf? My red is growing like crazy and it’s just spring (May 1st). When can i trim it back or should i leave it alone? Some of the limbs are draggin on the ground. Into what group would the “Bloodgood” Maple go? Mine had very fine leaves, divided almost to the stem. It was a dark purple red color. They will come up Red from seed, but are cold and drought susceptible. Late freezes will get tender tips. My japanese maple leaves drop in the fall. What kind of japanese maple is it. I treasure my book on Japanese maples by J.D. Vetrees. He is now deceased but his book pictures many, many Japanese maples. He had a world renowned collection. Japanese horticulturists used to visit his collection in Oregon. And he made many trips to Japan to study the many cultivars (and species) There is another book on ‘Maples’ published by Timber Press also in Oregon. I have a beautiful Japanese Maple that’s in it’s 3rd season since I planted it. It’s done very well. This is the red variety with very thin, delicate leaves that, except for the color, people think look like marijuana. Suddenly though, new branches several inches from the base, are sprouting what appears a completely different variety. The new branches have very broad, green leaves while the entire rest of the tree is still original. Any help? It is possible that the leaves growing below the graft may be those of the rootstock, while the ones above the graft are from the new stock. My split leaf maple (in a pot)..is in an enclosed Atrium..BUT open to the sky..Our climate is 5..It went thru it’s first Winter..lots of snow..Although it looked as though it was budding ( the scraped bark is green), late May..nothing more is happening…has been fertilized, morning sun, rather humid…. Fertilizer was probably not necessary. Organic material in the potting mix and VERY light ferts during growing season only if watering is frequent enough to leach all nutrients from the container. Did the rootball dry out during the cold months? If it is dead, it will snap off easily and appear brittle and brown. What is the best place (and best price) for purchasing seedlings? Wholesale prices typically run from $1.50 to $2.50. I usually pay about $1.50 each with freight. The wholesale supplier that I use does have a minimum order of $400 or $500. In our members area, http://backyardgrowers.com/join, it’s not unusual to find seedlings there for $2.00 or $2.50 and you can buy in fairly small quantities. Seedlings are a seasonal item, usually available in late winter/early spring. But I have also seen them offered in the fall. Hi, Mike. I was wondering if you could please give me some advice. I’ve been growing this tree from a seedling for two + years now and this summer it is really taking off and I’m at the point that I no longer know what to do. Should I repot it? Should I bring it indoors for the winter? Would it be better to get it in the ground? Although, I’m not sure where to plant it. Does it need staked? Should I bury more of the trunk? I think I’d like to continue growing it in a container. I really am a novice. I would have attached some pictures, if I knew how. If you’d kindly reply back to me, I’d really appreciate it. I am in Searcy, Ark. A: In the ground would be better. Should I bring it indoors for the winter? A: No, it needs to go dormant. Would it be better to get it in the ground? Although, I’m not sure where to plant it. A: Yes, it would be much happier in the ground, not in a wet area. Should I bury more of the trunk? A: Absolutely not. Planting too deep will for sure kill the tree. I think I’d like to continue growing it in a container. I really am a novice. I would have attached some pictures, if I knew how. If you’d kindly reply back to me, I’d really appreciate it. Thanks for the advice. It has been like my baby. Lol It’s 36 inches tall now! Is My Japanese Maple Dying? Growing Japanese Maples from Seed.